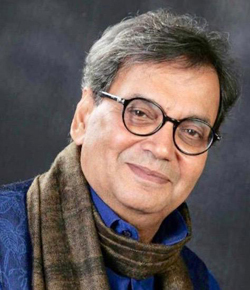 Subhash Ghai started his career in hindi cinema as an actor in Taqdeer (1967) and Aradhana (1970). He was the male lead in the 1970s Umang, Sherni, Bharat Ke Shaheed and Gumraah (1973) with Reena Roy and Danny. He turned himself into being a film writer in 1973 and sold his various stories and scripts to leading directors like Prakash Mehra and Dulal Guha in partnership with B Bhalla. His directorial debut was the film Kalicharan (1975) which was written by him and starred Shatrughan Sinha and Reena Roy which became a blockbuster instantly. After directing three films, Vishwanath , Gautam Govinda  and Krodhi , he turned film producer with his musical classic Karz in 1980. After directing Vidhata , his first film with Dilip Kumar and Sanjay Dutt; he formed his own company Mukta Arts Pvt Ltd. Under the Mukta banner he made evergreen musical blockbuster Hero introducing Jackie Shroff which was followed by many blockbusters in a row including Meri Jung, Karma, Ram Lakhan, Saudagar, Khalnayak, Pardes, Taal, Yaadien until 2001. Then came Kisna , Black and White  and Yuvraaj [ 2008] and produced many blockbusters including Aitraaz, 36 China Town, Apna Sapna Money Money, Joggers Park and Iqbal. He also produced regional films like Nauka Dubi in Bengali, Shehnai Chogde and Samhita in Marathi and Double Di Trouble in Punjabi. Like Alfred Hitchcock, he is known to give brief cameos in his directorial ventures. During the 90s, media honoured him with the title of Showman. This title was previously bestowed to Raj Kapoor known for his big musical movies and celebrations with magnum events. Both Pardes and Taal were released internationally and featured in the top 20 movies in the US box office charts for several weeks. As a producer he introduced film insurance policy in Bollywood first time with his film Taal and was the first one to initiate banks to finance movies. He was the first Indian film producer who took his company into a corporate public company in 2000 as Mukta Arts Pvt Ltd. and expanded its business from education to exhibition in movies and multi-media. Being a technology savvy person himself, he promptly promoted new technology in both, production and exhibition sectors both. As a director-producer he launched and groomed many upcoming and new faces in the industry like Madhuri Dixit, Manisha Koirala, Jackie Shroff, Sanjay Dutt, Mahima Chowdhary and Aishwarya Rai, Kareena Kapoor and Katrina Kaif and so on. He has been known as one of the best director in extracting great music from various composers and acting performances as well from each and every actor he has worked with. His past films still yield huge revenue through television and remakes. In 2001, he was the only film maker in India who set up an international film school Whistling Woods International in Mumbai. Operational since 2006, WWI has national and international students on campus and boasts of exporting education to many countries including UK and Nigeria and has designed media studies curriculum for CBSE high schools. Hollywood reporter has named Whistling Woods International, as one of the top ten film schools in the world with 400 students at campus and world-class facilities. It is certified as a global film institute in India by Skill Tree Knowledge consortium at House of Commons in 2014. His daughter Meghna Ghai Puri is the President of Whistling Woods International and expanding it to various states and countries. Recipient of many national and international awards Subhash Ghai has been honoured by the United States senate. He was the former chairman of the entertainment committee of trade body CII and a member of FICCI, NASSCOM and TIE global & its alliances. He has been on jury of Emmy awards for three years and on the international panel on film piracy at Cannes film festival in 2008. In the recent past, United Kingdom and South Africa have sought his expertise to help them set up institutions on their land. Under his able mentorship, the WWI teams have also helped the Hong Kong government to promote tourism in their country. In December 2013, the international confederation of NGOs and United Nations conferred the Karmaveer Chakra upon him for his contribution as an educationist to develop skill and innovative education in India in field of cinema and entertainment. Incidentally the song jai ho was to be a part of his film Yuvraaj , but Ghai felt it was unsuitable for the character played by Zayed Khan to perform this song onscreen. Later it was used in Slumdog Millionaire. After winning the Oscar, A. R. Rahman revealed in an interview that it was Ghai who had asked him to use the words jai ho in a song. He directed a short film on communal harmony in 1990 with Ranbir Kapoor, Sonam Kapoor, Tiger Shroff titled PYAR KI GANGA BAHE a song composed by Laxmikant Pyarelal on lyrics of Javed Akhtar. He conceived and directed a magnum audio visual stage show CINEMA CINEMA in 1991 celebrating 100 years of world cinema with 42 bollywood stars, 200 musicians, and 250 dancers on an 180 feet stage at NSCI, Mumbai. His production house is named after his wife Mukta Rehana Ghai and has two daughters Meghna and Muskaan and is chairman of Mukta Arts Ltd and Whistling Woods International. Today, his evergreen films Hero and Ram Lakhan are being remade by Salman Khan and Karan Johar with Rohit Shetty as director in association with Mukta Arts Pvt Ltd.
 Introduced many new talents and groomed them into stars such as Madhuri Dixit, Jackie Shroff, Meenakshi Sheshadri, Manisha Koirala, Mahima Chaudhary, Isha Shravani, Antonia Bernath, Jaaved Jaffrey, Saroj Khan, Shreyas Talpade, Anurag Sinha and groomed Anupam Kher, Anil Kapoor and Sanjay Dutt by giving them first blockbuster with stellar roles. He has also introduced many technicians and contributed to the development of Cinema.  His Company, Mukta Arts Limited came out with a public issue in year 2000 and became the first Company from Mumbai Film Industry to go corporate in 2001.  He was instrumental in bringing IDBI (Industrial Development Bank of India) and leading film producers on one platform by arranging a symposium which paved way for producers to get corporate loans for their projects from IDBI.  He is one of the pioneers in bringing the digital revolution in small centers of India by introducing digital projections systems in theatres, through a JV Venture with Adlabs [ 2005]  In May 2004 he represented India on the anti-piracy panel at the Cannes International festival along with other International personalities from the entertainment industry.  He acted as chairman CII [ Entertainment ] for two consequent years and planned many innovative steps to institutionalize the Indian entertainment and media industry.  He is the first filmmaker who became educationist in the history of bollywood cinema and set up the first private Film & Television training institute in Filmcity Mumbai in 2006 with an investment of over Rs 50 crores. Named Whistling Woods International, this institute of world-class standards, curriculum, faculty, infrastructure & affiliations has redefined the meaning of professional Film & Media Education in South Asia. Whistling Woods is Asias largest film and animation school declared as one of the top best schools of the world by Hollywood reporter.  Charity for earthquake victims of Armenia, Russia (in 1889). Participation in campaigns for AIDS, anti-drugs campaign (in 1990) and many other social issues from time to time.  Produced and Directed a music video for Doordarshan on National Integration Pyar ki Ganga (in 1993).  Participated in Mr. Sunil Dutts Mahashanti Padyatra for peace in Punjab.  Contributed towards Chief Ministers fund for earthquake victims of Latur.  Contributed towards Prime Ministers fund as well as the Army Wives Welfare fund at regular intervals through Charity premieres.  Spreading and promoting media education in various states of India and introducing in CBSC syllabus in 2010.  Special recognition award at the Zee Cine Awards 2007 for opening up Whistling Woods International - Asias largest film, television, animation and media-arts institute.  Pune International Film Festival special distinguished award for his outstanding contribution for last 35 years as film maker and educationist (In 2011).  Honored as a leading Educational Evangelist of India by ET NOW.